Cornish Sea Salt Caramels, a 2012 Gold Star Great Taste Award Winner created by London's finest artisan Chocolatier Marc Demarquette. 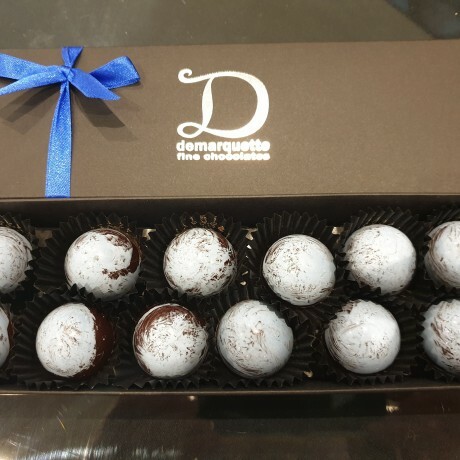 Individually hand-painted chocolates made using dark 71.1% house blend, filled with luxurious creamy caramel made with pure cream and Cornish Sea Salt. 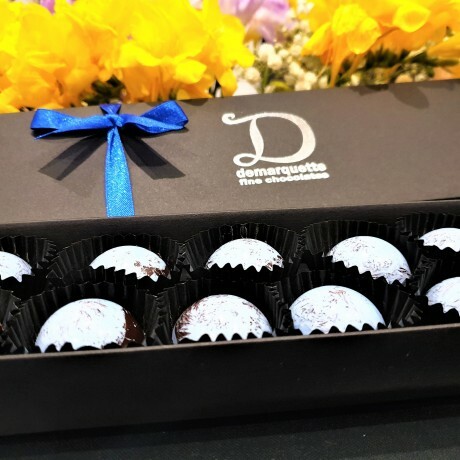 Choose from gift boxes containing 12, 24 or 48 chocolates. 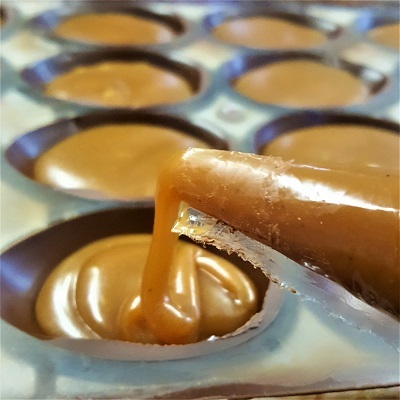 Caramels: Dark Chocolate: Min 71% Cacao Solids, Cacao Butter, Sugar, Emulsifier: SOYA Lecithin, Natural Flavouring: Vanilla. 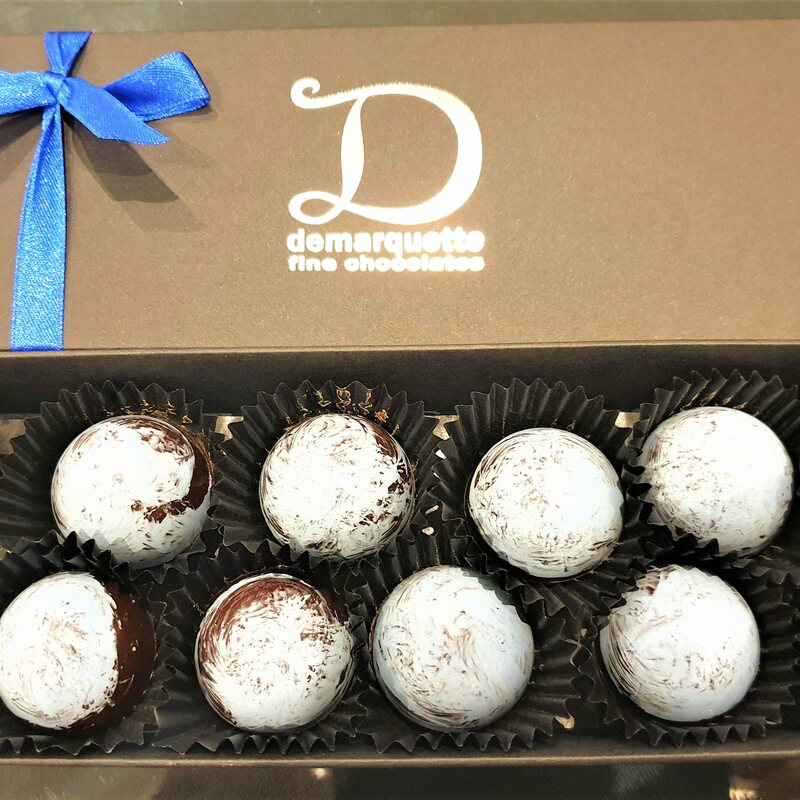 Milk Chocolate: Min 35 % Cacao Solids, Cacao Butter, Dehydrated MILK Solids Min 25% , Sugar, Emulsifier: SOYA Lecithin, Natural Flavouring: Vanilla. Caramel: Cream (MILK), Sugar, Butter (MILK), Glucose, Citric Acid, Natural Flavouring (may include Strawberry, Rhubarb, Plum, Raspberry, Apricot, Sea Salt, Fennel, Honey, Rose, Violet, Lavender, Manuca, Elderflower, Carrot, Pepper, Olive oil, Chili, Rosemary, Thyme, Mint, Spices, Coffee, Black Tea, Green Tea, Fig,) Colourings: E171, E129, E102, E110, E132, E142.Colours may cause adverse effects in Children. For allergens see ingredients in CAPITALS. May also contain traces of nuts and seeds.